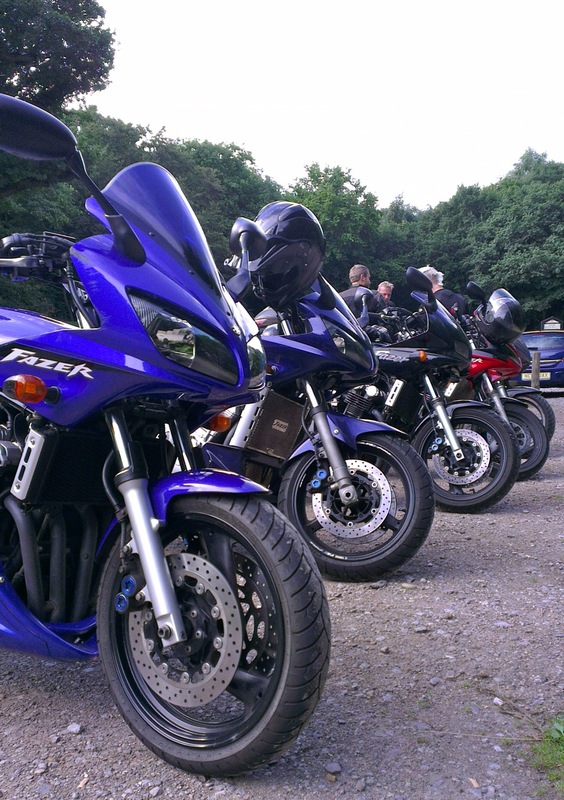 I went for my first ride out at the weekend with the FOC (unofficial Fazer’s Owner Club), London lot (LoFo). We started off in High Beach, Epping at the well known tea hut, then made our way North up through Great Dunmow, Saffron Walden and finished up near Royston. The the plan was to meet up with the (slightly more) Northern branch of FOC and then ride back to Epping together. Everything started off well, but the day didn’t continue as planned. First stop was a Police road side group waving us all down. Uh-Oh. However, rather than inspect all our bikes, they tried to persuade us to sign up for the Bike Safe course and gave us all free tea, coffee, burgers and bacon baps. After a good chin wag about the virtues of the different BMW bikes used by the force, off with continued. Second stop was by a copper on a bike following us and pulling one of the party over for having a dirty number plate. TBH it was pretty filthy, but thankfully he got off with just a warning. Off we continued at a good pace to make up for lost time. All was good until after Saffron Walden, when we took some twisty roads towards Royston. Some fun bends, but unfortunately one took the better of me. Bit tighter than I first expected, panic braked a little on the bend, went more upright and then wide. Followed by total target fixation on the gravel verge and I just lost it and down I went on my right side. Thankfully I had shed most of my speed before hitting the deck, but the front fairing took the brunt of the impact. Nice big scuff and crack by right headlight and all bend slightly to left. Also landed on the exhaust, popping it off. So annoyed with myself, could have made the corner fine if I had just leant over more. Grrr. We all took a breather and just checked out the bike. Just cosmetic damage and nothing serious. It was a this point we saw the rest of the FOC group we were supposed to be rendezvousing with going the other way – and they didn’t even stop for us! At the point we made the decision to head back to Epping and try to catch them up. However the other lot took another route (towards Finchingfield) and so didn’t get to Epping until sometime after us. Despite the above incidents, it was a good ride out. 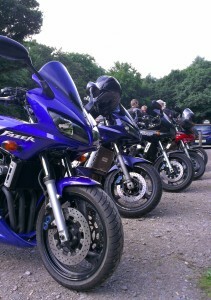 Lovely weather, great to catch up with other Fazer riders. I’ll do my best to make the bike good. 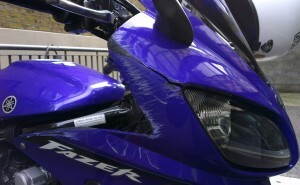 Ultimately I’m still awaiting the verdict of my last insurance claim (yes the one from April! ), which was due to replace fairing, belly pan, bars etc anyway. My insurers have issued court proceedings against other party, they now have 21 days to respond.